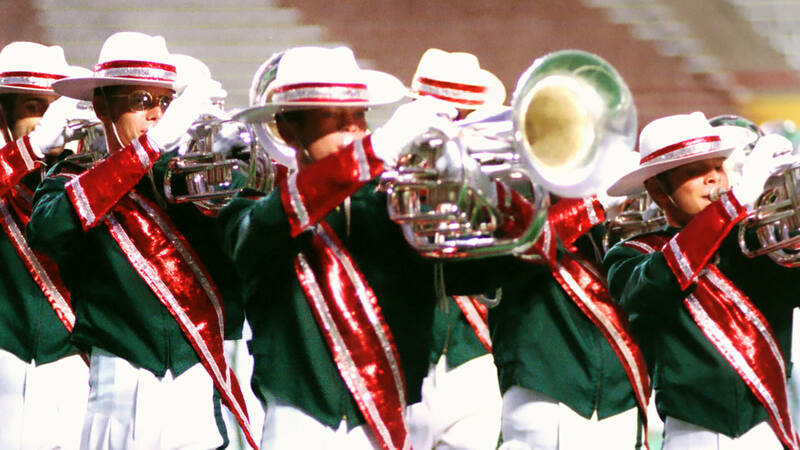 When drum corps fans think of the 1999 Drum Corps International Summer Tour, it’s likely they’ll remember the tie for the World Championship title between Blue Devils and Santa Clara Vanguard at the University of Wisconsin’s Camp Randall Stadium in Madison. Also that year, fans welcomed Boston Crusaders into the Finals for the first time in history. The Crossmen organization celebrated its 25th anniversary and Glassmen appeared among the top-five corps for the second year in a row. The Madison Scouts’ sixth-place production of “Jesus Christ Superstar” was based entirely on the music of the famed 1970 rock opera by composer Andrew Lloyd Webber and lyricist Tim Rice. The songs appeared on an album several months before the musical opened on Broadway for its first staging in 1971. Despite its massive popularity on Broadway, it won no Tony Awards. Based on the stories of the Gospels of Jesus Christ’s last week before his crucifixion, “JCS” wasn’t immune to controversy. Some religious organizations proclaimed it to be blasphemous or anti-Semitic, and some considered the treatment of Judas to be too sympathetic. While some thought it took too many liberties by creating storylines not in the Holy Bible, others couldn’t get past the many allusions to contemporary life. Still, the musical’s success resulted in the release in 1973 of a movie adaptation that was the eighth highest-grossing film of the year. Prior to the show, the Scouts played an on-field warm-up of “I Don’t Know How to Love Him,” perhaps the most-loved piece of the musical and one of the rare songs to have two recordings in the Top 40 at the same time; one by Helen Reddy, and the other by Yvonne Elliman, the singer who played the role of Mary Magdalene in the original musical production. The corps kicked off the competitive portion of the show with the mysterious introduction to “Overture,” the very beginning of Act One from the musical that introduced a short extract from “Superstar” during a diamond block rotation drill maneuver of the entire corps. A minute into the show, things kicked into overdrive with the distinct driving jazz feel of “Heaven On Their Minds,” originally sung by Judas as he expressed concern for the consequences of Jesus’ increasingly popular fame. The horns were positively searing during this selection, capturing the same raw and fanatical forcefulness witnessed from actor Carl Anderson as he sang the song in the movie. The mallets in the corps’ front ensemble percussion section started “Everything’s Alright” from Act One, a rare pop tune written in a 5/4 time signature. The ever-building volume and intensity provided a backdrop to some passionate work from the color guard members with sabers. “King Herod’s Song,” in the original selection from the musical where Jesus was brought to the King of Galilee for judgment, was the first selection from Act Two. It started with a baritone solo and duet that was followed by a ragtime section, with a horn sextet standing behind a percussionist on cocktail drums. Such drums are typically a mini drum set played while standing up, a pedal hitting the underside of a vertically oriented bass drum. It was here that spectators witnessed something probably not seen on the drum corps field in at least three decades, old-fashioned close-order military drill based on tight squads marching at a standard eight-to-five step size. With pivoting files rotating and arms swaying as the buglers played with one hand, this segment was a drum corps history lesson wrapped up in less than 20 seconds of burlesque-style ragtime. After this segment, the piece continued with the front ensemble percussion section playing in an animated ragtime player piano style, followed by the brass players high-stepping in a block triangle form, mirrored across the 50-yard line by the color guard members. The drum major, a mace in hand, led the charge in the style of a collegiate marching band. Flags turned blood red in the ominous “Trial Before Pilate,” displaying high-sticking drumming during a percussion feature. Flags turned a royal blue for “The Temple,” a 7/4 time signature selection from Act One. That piece ended with a spectacularly loud company front that melted into the solemnity of “John 19:41,” the heartbreaking and poignant ending of the musical where followers flocked to the crucifixion site to pay homage to Jesus. A brief section from Act One’s “Simon Zealotes” led into “Superstar,” one of the songs that hit it big on 1970s radio. It returned in a lengthier version than heard earlier in the Scouts’ production. One of the visual highlights of this production took place when a solid square block of horns and drums swiveled toward the 50-yard line and evolved into the form of a cross. That form pushed forward four counts before dissipating into a five-pointed star that ended the show, the star surrounded by festive flags of sunrise yellow.